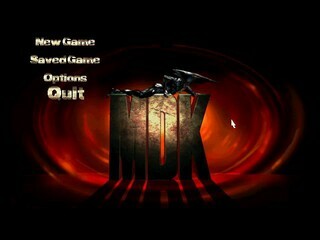 Released in 1997 by Shiny Entertainment, MDK is a game where you control a guy wearing tyre inner tubes with a sidekick six-armed bomber-flying dog, and a weird scientist guy for a boss. The enemies all think you're a jerk too, and will taunt you incessantly. Well, up until you kill them anyway. Also, World's Most Interesting Bomb. Think about it. Eh? Eh? Best time on Easy difficulty: Single-segment 0:39:17 by Romain 'Spocky' Picot on 2013-08-07. Hello everyone. This my run of MDK single segment. First of all, you can find information about this run on the wiki: https://kb.speeddemosarchive.com/MDK. With this you can learn about all the tricks used in this run. - Level one: When you start, you have to take all rockets if able and don't forget the super chain gun. Even if I miss the sniper shoot on the ennemy, I loose no time because I've to wait for the nuke. The OOB is really good with no problem with the ennemy, sometimes he block you and in this case it's a reset. In the next room I kill some ennemy. If they touch me, I'll be down and loose 2 seconds. I rather prefer take the other super chain gun it's still usefull. Don't miss the plane, it's one cycle win. I loose around 2 second because I'm not able to take the nuke. The fall is not dangerous if you use the parachut. The jump room is really pretty, I take really short direction. The room with all ennemy is really good too, each fall is 2 sec loose and on every try, I'll always fall so two is not too much. For the boss, just don't shoot near the head without touching it, it will be a five minutes boss fight. -level 2: This level is not so difficult but have the major problem of the run. A random room where you have to wait the nuke. In the shooting room, I rather prefer to loose some time and don't have to fall. The mortar room is not so good but I still have good run so I didn't stop. Unfortunetly, I've to take the 50\% health in all case. After avoiding a room, I've some difficulty to prepare my setup to avoid the next one. And it's the random room. In this run, I've some luck and have a really quick nuke so at this point I know that is a really good run. For the boss, if I've some luck I'll be able to kill him before I went to his vehicule but this not happen, so I use my sniper boom on it. -level 3: At this point taking dommage on the fall could cause some problem so I'm carefull on it. In one room, I make some backtrack, it's just to trigger the ennemy and loose the minimum amount of time. I've to take the apple. before the room where I destroy everything. I've to do this to have the door open. On the air stream I can go on the end but it's really hard. For the boss I've to destroy the four point which appear. The quickest way is to make it in one cycle to win time. -level 4: Level on a "snowboard". So most of the time, you will have to wait. So I jump and turn it just for some fun. In one arena I take some hand grenad and homing sniper grenade. It'll be usefull for the boss. You can see some earthworm jim head, if you take them, a cow destroy an ennemy. I loose some times to to take 5 hand grenades, I'll help me for the same point. The last snowboard part, you can be hit by some ennemy to prepare the final stream but you have to be carefull and don't die. And even if I didn't want, I take some life. It's a mistake of course. The boss need a grenade spamming to be kill and it's what I did. level 5: In this level all object can be used in the next level. Unefortunetly the game put the super chain gun too low so it's a complete loose of time. But with 1:59 before my PB it's not time to reset. After the real good ship, I make some jump mistake. all goeas good except some mistake so I'm really confiant here and I'm thinking to a sub 40 run. the room goes really good and didn't forget usefull object for the next level. In the room where you have to jump, I stop strafrunning to not fall. In all case, I have to wait the car so it's not really a problem. The last ship is really good so I not loose lot of time. On this stream, if I die, it's game over just have to make it. level 6: At the beggining have to wait a lot of time I can't avoid it. Because have enough sniper boom I didn't the first one. I take real good platform time at this point which is really difficult when you feal tired. The boss need 12 sniper boom to fall and open the way so it's a spamming time. For the last boss I use strafrunning and air stream glitch to free the dog with one nuke to finnaly kill the boss under 40 minutes with a 39:52 time.